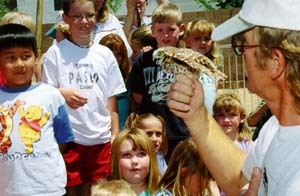 Background: The Paseo Verde School had one Burrowing Owl living in a parking lot drain. The school wanted to give the owl a better home. We knew we could add artificial burrows to the site and the owl would probably move to the new burrows. However, if we also made it a release site then there would be a new colony for the resident owl to join. The staff at the school wanted to make the addition of the owls and burrows as much of an educational resource as possible. Why not add infrared cameras to the burrows? We constructed four aluminum burrows with removable camera mounts, infrared optical movement sensors, and temperature sensors to provide a way to see the owls and record other kinds of data for owl science studies at the school. 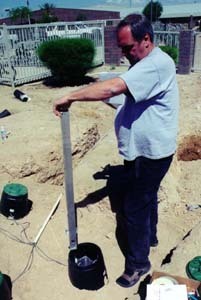 Here is one of the aluminum artificial burrows. The triangle shape is the burrow where the owls live. It is shaped like that to match the field of view of the infrared camera. The square tube at the top of the image is the camera access tube. It allows the camera to be extracted after the burrow is buried in the ground. The white tube at the bottom of the image is a four-inch plastic pipe that holds the motion sensor and connects to the four-inch black flexible tubing that leads to the surface. The motion sensor is located where the small white bumps are located. Here is the same burrow seen from the front.There are four burrows in a common pit. 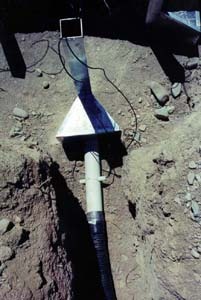 Each burrow has a vertical access tube for a removable camera. 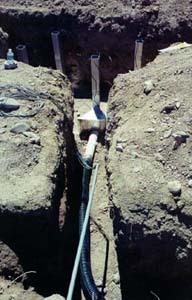 Note the small pipe with a wire bundle in the foreground. The camera and sensor wires run about 350 feet underground (in plastic pipe) from the burrows to a classroom. This shows the burrow pit after it is almost filled to the top with dirt. The plastic access tubs are still exposed that protect the tops of the camera tubes. When completely filled with dirt, only the green lids will be visible. Brian is holding one of the four camera tubes. The camera is down at the bottom of the tube. 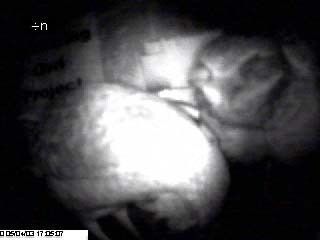 When inserted and locked into place, the camera is at the same level as the owls in the burrow. 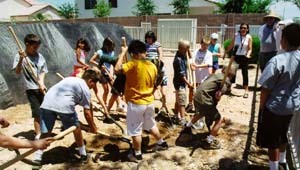 After the release tent is erected over the burrows, Paseo Verde students help shovel dirt onto the bottom of the tent to hold it in place. The release tent is the black structure on the left. Just before release into the tent, the students get to see the owls close up. Here Bob Fox from Wild At Heart points out some of the more interesting things about Burrowing Owls. 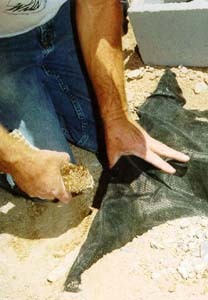 Bob Fox lifts up the edge of the release tent so that one of the owls can be placed inside. Four owls were released at the site. Wild At Heart provides mice to the Paseo Verde staff so they can feed the owls for a month while the owls are in the tent. By keeping the owls in the tent for a month it builds "site fidelity" to their new home. After a month the tent comes down and the owls are on their own. This is a frame from the short infrared video that you can download at the end of this page. Here is a pair of owls with one owl preening the other. The owl in front (and left) has her head down and you are looking at the back of her head. You can also see her feet (somewhat obscured). The owl in the back (and right) is looking almost directly at you. He has just finished preening his partner. The camera is located about 3-4 inches from the closest owl. The illumination is created with infrared LEDs and the owls are not supposed to be able to see in the infrared light frequency range. So to them, they are still in the dark. There are two files for download. The first file is 400k and has a short play time. It will play in Windows Media Player automatically if that is your default player. QuickTime users may need to save the file so QuickTime can convert it before playing. The second file is 2.85 mb and shows one owl entering and leaving the burrow. b i r d i n f o @ m i r r o r - p o l e.com.